Beat together eggs, cream, sugar and vanilla extract. 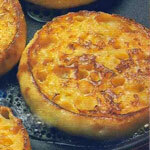 Soak English muffins, cut-side down, in mixture for one minute; turn and dip other side to moisten. Stack muffins, cut-side up, until ready to cook. Fry muffins, cut-side down, in butter over medium heat until golden brown. Turn; fry 2 to 3 minutes more. 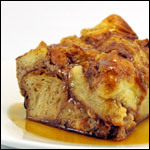 Serve with maple syrup. We found this recipe in a vintage 1988 ad for Bays English Muffins. 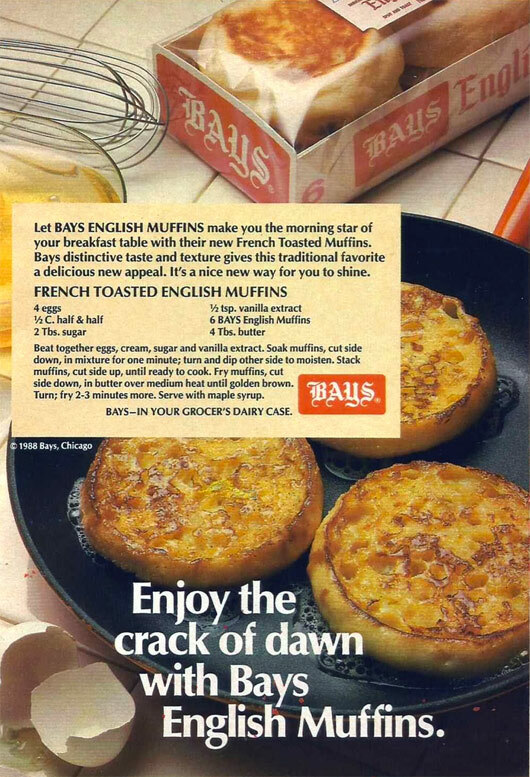 The ad also featured this promotional text: "Enjoy the crack of dawn with Bays English Muffins. Let Bays English Muffins make you the morning star of your breakfast table with their new French Toasted Muffins. 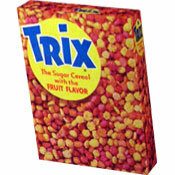 Bays distinctive taste and texture gives this traditional favorite a delicious new appeal. It's a nice new way for you to shine." 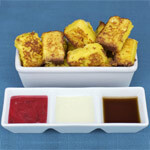 This clever twist on traditional French toast uses English muffins instead of sliced bread. From a vintage 1988 ad for Bays English Muffins. 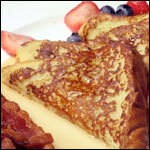 What do you think of French Toasted English Muffins?